AMB moisture balances provide a rapid and accurate method for moisture determination and dry weight analysis of a wide range of products and materials. In research work, as well as in manufacturing and quality control applications it is essential to be able to determine moisture content simply and reliably. AMB moisture balances provide moisture content data as a percentage of initial mass or of the residual dry mass. The operator sets the drying mode using one of the 7 preset modes and test temperature and time.Â The balances can also be set up to display percentage solid content. A suitable sample of the product is placed inside the drying chamber, test parameters are entered via the keypad and the analysis is started with a simple key press. 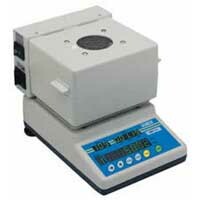 Two quartz halogen heaters provide constant, even drying of the sample at a temperature pre-selected by the operator. The advanced software closely monitors the temperature in the drying chamber and maintains it to within 1Â°C of the chosen setting.Â Memory for the temperature correction of up to 9 types of products can be user programmed. As the analysis progresses the balance displays the current status, in accordance with the chosen parameters, keeping the operator updated on each stage of the process. The analysis will automatically terminate either when drying is complete and the dry weight is stable, or after a fixed time specified by the operator. The final analysis result is shown on the large LED display and the last drying procedure will be stored. At the end of the analysis all relevant data concerning initial mass, residual mass, test parameters and results can be sent to a printer or PC via an RS-232 interface. When the moisture balance is connected to a PC the optional data acquisition software allows the operator to produce a graph plotting results against time, providing valuable information on speed of drying and confirmation of dry weight stability. Results of individual tests can be stored in the computer memory for subsequent comparison. This scale (Excluding AMB50 Model) has either been discontinued or the model number has changed.Â The information on this page is for viewing and reference purpose only.Â Please call us at 1-800-526-0070 for the replacement model number or to suggest a comparable model. Thank you.